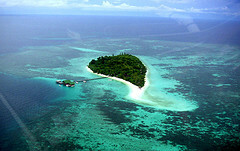 Lankayan Island is located a 1 hour fast boat ride from Sandakan, off the east coast of Sabah. A tiny island fringed by white sand beaches it’s a little gem in the Sulu Sea. There is one eco resort on the island which has been responsible for discovering the dive sites in the area, and they’ll found some great sites. You can dive reefs or wrecks and Lankayan. You can see the biggest whale shark or the smallest goby. Lankayan diving is all year round although visibility drops considerably in the off season. The best diving conditions are between April and September when the sea should be calm. April to May brings regular visits from passing whale sharks. Although whale shark sightings are a possibility at Lankayan it is really a macro diving destination with a wonderful selection of smaller reef critters to find and photograph. 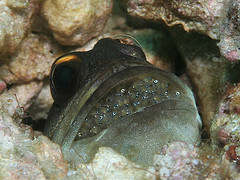 The most popular subject is the jawfish, especially when it is holding it’s eggs in it’s mouth. There are also various nudibranch species, frog fish, leafy scorpionfish, cuttlefish, morays and crustaceans. There are over 20 dive sites around Lankayan island, most of them just a short boat ride away and one wreck is even excessible directly from the jetty. These dive sites were recently protected by marine national park status. Currents are normally mild at Lankayan and most dives are no deeper than 30m making this a dive destination for all levels of diver. There is also excellent snorkelling from the beach and baby blacktip reef sharks often come in the shallows close to shore. Jawfish Lair is one of the best and most popular Lankayan Island dive sites. It’s named after the jawfish that are always seen here. Jawfish grow to larger sizes here than in the rest of Sabah. They are still pretty small here and it takes a trained eye to find them. Normally they show just their head out of their rubble burrow although sometimes the feisty little characters venture further out and display their whole bodies. Very lucky divers can see them with a mouth full of their eggs, a much sought after photograph. There is much more to see at this dive site besides jawfish. A very special critter is the mimic octopus which tries to protect itself by imitating other marine species. What it mimics depends on what predator is close by, popular impersonations include the banded sea snake and cuttlefish. Ornate ghost pipefish, scorpionfish and frogfish are other cryptic reef inhabitants at Jawfish Lair. Nudibranchs and sea slugs do not disguise themselves but instead allow their bright colours to warm predators of their poisonous skin. Hard coral species on the reef include table coral, robust staghorn coral, bush coral, maze coral, mushroom coral and pore coral. Cristmas tree worms and feather stars add colour as do sea stars and encrusting sponge. Spiny sea urchins will cause pain to any diver who gets too close. Bubble corals, resembling bunches of white grapes, are home to shrimps. Small reef fish such as anthias and damsels make their homes in the coral. Other residents are parrotfish, triggerfish, trumpet fish and grouper. Schools of snapper and fusilier are ever present. On the sandy patches at the edge of the reef it is possible to see stingrays and leopard sharks. The maximum depth is 30m. Currents are usually mild. Visibility can range from just 5m up to 20m. The Lankayan Wreck was once a Sulu sea fish pouching boat that was confiscated by the authorities and sunk in 1998. The wreck now sits upright in 30m of water and acts as home to thousands of fish both big and small. The steel steel rails and most other areas are encrusted with corals, sponges, barnacles and clams. Small reef fish shelter inside the hull. Bigger species are bumphead parrotfish and grouper that patrol outside the hull. Barracuda can often be seen in the blue water away from the wreck. Ornate ghost pipefish are resident on the wreck. Between April and May it is possible to see whale sharks. Currents are usually mild. Visibility is not great, between 5m and 15m. The Mosquito Wreck was part of the Japanese Mosquito Fleet during World War II. The wreck now lays in 25m on her side and is in surprisingly good condition. The bow gun is still intact. There is loads of fish life in and around the wreck including schools of snapper and trevally. This is another dive site that gets whale shark visits in season. This dive site also has minimal currents with 5-20m visibility. The Jetty Wreck is a small wooden fishing boat that was sunk just away from the long jetty as part of an artificial wreck that includes tyres and other wooden structures. The wreck is small and of no historical interest but the marine life on it is pretty impressive and it is a very easy, convenient dive. Divers can grab their gear at any time of day, giant stride off the jetty and follow the guide rope out to the wreck. This is also a great night diving spot. The deepest part of the wreck is at 20m and visibility is around 15m. Fish on the wreck includes schools of batfish and snapper. Scorpionfish and painted frogfish are hidden in several places. At the end of the dive swim back to the jetty and spend some time with the dozens of common lionfish that hang around the jetty pylons. This is a great place to practice photography skills.